What's On > Why we love Peter Kay's Car Share! 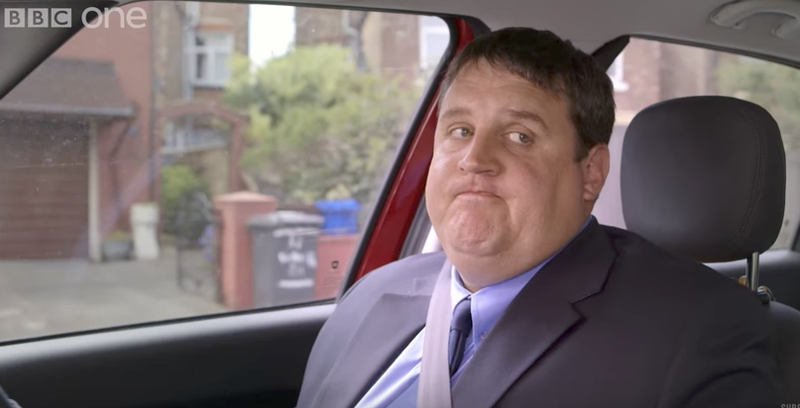 Why we love Peter Kay's Car Share! Have you been watching Peter Kay’s Car Share? The comedy series follows supermarket assistant manager John Redmond (played by Peter Kay himself) and his company car share companion, promotions rep Kayleigh Kitson (Sian Gibson). It started in 2015 exclusively on iPlayer, and was created by writers Tim Reid and Paul Coleman. Fans of Car Share will be delighted to hear that Peter Kay and Sian Gibson are reuniting to create a brand new TV show. Although details of the show are being kept a big secret, the two have been regularly meeting up to discuss it. Sian told The Sun newspaper's Bizarre TV column: “I was with Peter the other day and we have got something in the pipeline. There are things to think about." Could it be another series of Car Share perhaps? We last saw their two characters, Kayleigh and John in the two special episodes that were broadcast this year, ending with the duo driving off together in a bus and Sian admitted she liked the updated finale. She said: "That was the final, final one. I liked the conclusion because they got a happy ending." The two special episodes came after disappointed fans began a petition for more episodes and a different finale. Peter previously admitted he was shocked when the petition was created. He said: "You'd never believe that it'd ever have that kind of effect. A petition." Sian added: "Yes, that was crazy. I signed it ... twice." Peter said: "That is incredibly flattering. We always knew the second series would end that way and we thought people might be a bit miffed but never thought they would be so devastated. "We decided to write another episode that hopefully gave the characters a resolve and I thought lets hold this back until the repeat of the second series. "It was hard to keep it a secret after the reaction we got, but we never said that there wouldn't be any more 'Car Share' ... we just said there wouldn't be a third series." Would you like to see more episodes of Car Share or would you prefer to see Peter and Sian in a whole new series? Let us know over on our Facebook page and Twitter page. After the final episode of Car Share left fans disappointed they didn't get the romantic ending they were hoping for. When talking about a possible return of Car Share in the future, Sian Gibson told Radio Times to 'never say never'. Meanwhile, Peter Kay mentioned the shows editor, Matt Brown, saying he will "miss working with him until the next project." but refused to reveal what the project was, with Sian joking "that would be telling". What do you hope Peter Kay's new project will be? Let us know over on our Facebook page and Twitter page. Fans can expect to see an improvised special of Car Share May 7 at 10pm. An official statement on his website reads: "A brand new Car Share: Unscripted special will be on BBC1 at 10pm on Bank Holiday Monday, 7th May on BBC One. "The episode is completely improvised. "Then a full second series repeat of Car Share on Monday nights will conclude with a brand new series finale to be screened on the second Bank Holiday, 28th May." He said at the time: "Well it's been a very hard secret to keep ... We were getting constant abuse about it, people were very angry that the series ended in that way, but there is a season finale explaining what happened after the big argument." Fans that were at the special charity screening of the episode in Blackpool claimed it was "pure genius" so we're very excited to see what surprises are in store for John and Kayleigh! Three months since Peter made the announcement that he is cancelling his tour due to 'unforeseen family circumstances', the comedian broke his silence on Twitter with this exciting news. A charity screening of his sitcom Car Share was held at Blackpool Opera House on Saturday April 7th and Peter even turned up to greet fans! Fans were delighted when the 44-year-old came on stage to greet the 3,000 fans and thanked them for coming to see the final episode of Car Share, which will be aired on the BBC in May. The event raised money for The Lily Foundation, that treats children with mitochondrial disease. During his brief appearance which one fan filmed, Peter said, "Enjoy the last ever episode of Car Share. Don't tell anyone the end. Or tell anyone about any hedgehogs." Leaving the stage, he added: "So thank you. Lots of love, enjoy, take care, bye-bye." Good news for fans of Sian Gibson - who plays Kayleigh - as you can see her popping up on Death in Paradise this Thursday. She'll be playing Gilly White who is a research assistant to a murdered author. "I'd be lying if I said working in the Caribbean hadn't been a big bonus!" Says the actress, who filmed on the island of Guadeloupe. Tune in to Death in Paradise on Thursday at 9pm, BBC One. Watch these hilarious outtakes from Car Share! There are plenty of reasons why we love Car Share - here are just a few! Peter Kay himself – we’ve long been fans of the funny man, and it’s lovely to get a regular dose of his humour on TV again. We’re also thrilled to see he’s touring the country again next year too. We recognise the locations! It’s set in Greater Manchester, with filming taking place in Bolton, Manchester, Trafford and Salford. Car Share follows a clever format, with the first half of each episode following the two to work in John’s Fiat 500, and the second half seeing them return, talking about their day. It’s a wonder no one’s thought of before. It’s an award-winner. Since it first aired, it’s won a host of awards, including two BAFTAs, as well a huge legion of fans – including us! The hilarious radio station – Forever FM – which Kayleigh and John listen to in the car. It’s always spouting ridiculous adverts which make us hoot, and we love when the pair have a sing-a-long. The silly billboards in the background, which reward close attention. Our favourites: ‘One meal for the price of two’, and ‘No pies left in this van overnight’. Short and sweet. While we’re sad that there are only two series, it does mean (like classics including Fawlty Towers) that we’re left with the memory of a faultless show. Plus – as a Brucie bonus – Peter Kay has announced that there will be two surprise episodes on BBC One in 2018. We can’t wait to see what happens between John and Kayleigh – fingers crossed for a happy ending. Why we love Mrs Brown's Boys!